A lot of speech therapy is adult directed. The speech pathologist decides the task, how to play, how long it will take, and the end reward (if there is one) leaving little control to the student over their topics of interests. Every once in a while it is important to incorporate highly motivating and even “hot” topics into speech therapy to engage children and even leverage a little more “buy in” from sometimes reluctant participants. One clever way to do that is with Angry Birds. Angry Birds is a popular (12 million downloads can’t be wrong) and relatively new (introduced in 2009) digital game. The goal doesn’t have much at all to do with speech and language and is based on the premise of using a slingshot to launch some colorful birds at pigs stationed in various structures. While the content leaves SLPs little to work with in the way of content for articulation therapy, the characters and premise of “launching” is an easy one to work with in speech therapy. Provide a child with a list of target sounds/words and reward them with the correct production by giving them a pieces to build with. Attach articulation targets (words or sounds) to the structures themselves. After launching a bird and knocking it down, children should describe what target got hit. Encourage use of descriptors by asking the child to describe which bird they will use next. The birds come in various shapes and sizes. To get creative, try putting other small toys into the slingshot to vary the vocabulary. Ask children to retell what they attempted or did and the end result after each launch. This can target temporal concepts (e.g., first, next, then) or cause/effect relationships (e.g., “because I aimed too high, the bird missed the pig”). Because the game comes in several versions now (Angry Birds Space, Angry Birds Rio) choose a different theme to diversify vocabulary. You might play a guessing game with the child using descriptors and clues as to where the game will take place next, and vice versa. 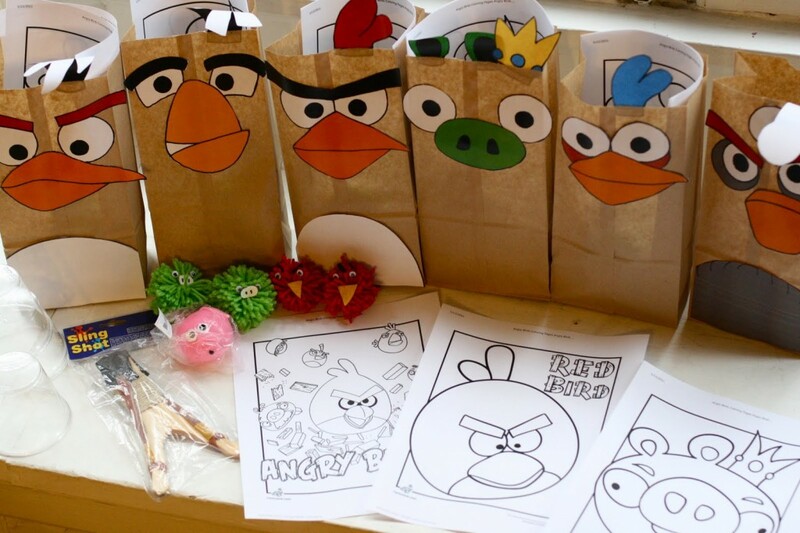 Make Angry Bird Character bags. Use these for descriptive vocabulary (e.g., look in the bird with the yellow beak) or tossing target words/sounds into them (e.g., throw your R sounds into the red bird). 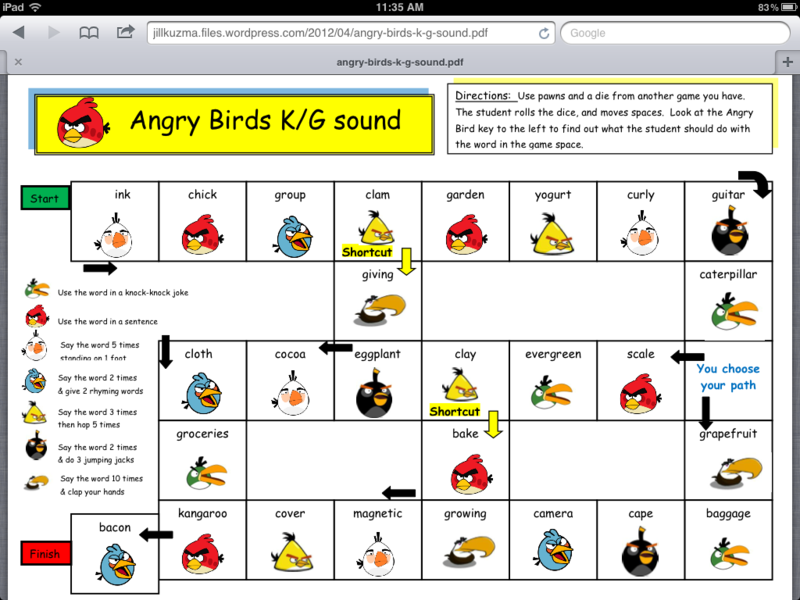 Make a game board with Angry Bird articulation targets for your clients like this one by Jill Kuzma.